Any prolific reader would recognize the Penguin book logo when they saw it. It's everywhere - and well it should be. Penguin Books is turning 75 years old! They've been around long enough for anyone to take good notice of them! Penguin created a 75th Anniversary website if you'd like to learn more about them. One cool feature is the Penguin Timeline. It starts in 1935 when founder Allen Lane published the first Penguin title in England, which sparked a "paperback revolution." Best yet, they are hosting a huge giveaway and offering bloggers some of their favorite titles. I was asked if I would like to select a title for myself and one of my readers. 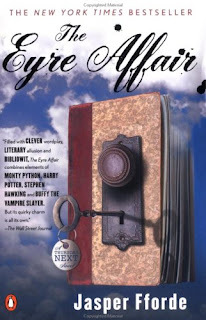 I picked The Eyre Affair, by Jasper Fforde because I had been wanting to read it! So, I'm being sent a copy and one of you will also be sent one! Would you like to win a copy to read alongside me? To win, simply leave a comment below. This contest is open to U.S. Residents only and will be open through Thursday, August 5th. I will announce the winner on Friday, August 6th. This contest is open to U.S. Residents only. What I'm most afraid of is that I will absolutely love this book series and then will have to track every title down. Oh the horrors of it all, right? Here's a HAPPY ANNIVERSARY to Penguin Books and thanks for the gift of the book to myself and one of my readers! Looks like an interesting read, and different from what I'm normally have to choose from around here. Too funny... I just started this novel last night! Wow! What an intriguing plot line. I've never read a book like this. Sounds interesting. I love Penguin, and remember MANY books from childhood had that friend on the spine! I'd love the chance at this book! It sounds like a good story, I would like to read it. You know, I don't think I have this book in the series. Sign me up. Time travel is so funny . . . no it isn't! This is me, from the future, warning you to not pick me! I've never won a book blog contest before. Maybe today's the day! Oh wow! I adore Jasper Fforde. Never read anything by that Author. I always need a new book to read! I'm going to have to add this book to my to read list. This sounds like a fun read! Please enter me! Thank you! Sounds like a great book. I would love to win it. Sounds like a fun and quirky read. Sounds interesting, count me in. Thanks. I would absolutely love to win this. My daughter's favorite literary character is Jane Eyre. This would make a great Christmas present. This looks intriguing! It will definitely be added to my TBR list regardless of whether or not I win. 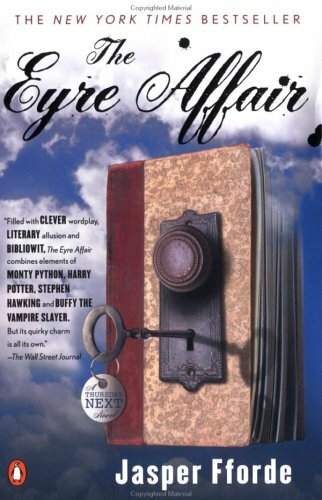 I really like Jasper Fforde. Please enter me! Great! Please count me in. Sounds kind of quirky. I'd love to read it. wow! sounds like a great fun book! I would love to win this book. I've actually had it on my wish list for awhile now.